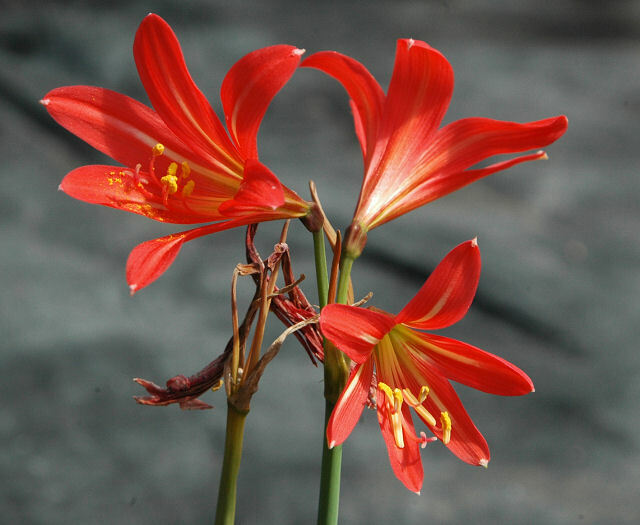 Rhodophiala is a genus of southern South American Amaryllidaceae that look like small-flowered hippeastrums or multiflowered habranthi. 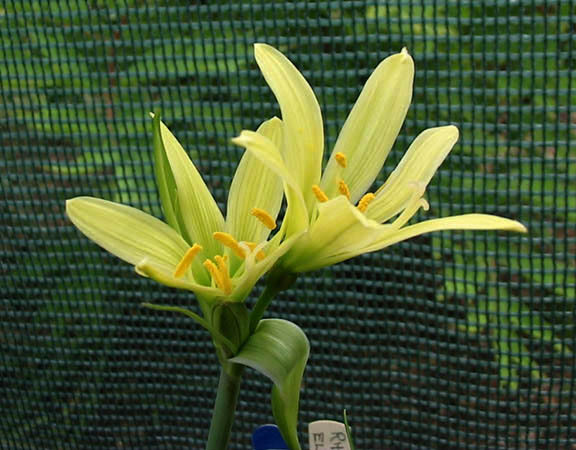 It has been placed in Hippeastrum, in the former Amaryllis or even in a new genus Rhodolirion. 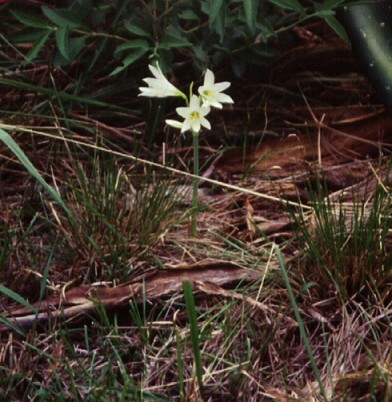 The foliage is very different from all known hippeastrums and rather resembles that of the large flowered Habranthus or Zephyranthes (i. e., narrowly strap-shaped). The autumn/winter/spring growing Chilean species that need a dry summer dormancy, like R. bagnoldi, R. ovalleana, R. splendens, R. advena. All of them are better grown under frost free conditions although several of them can be quite tolerant of cool conditions. Some flower in autumn without leaves, others in spring with leaves. 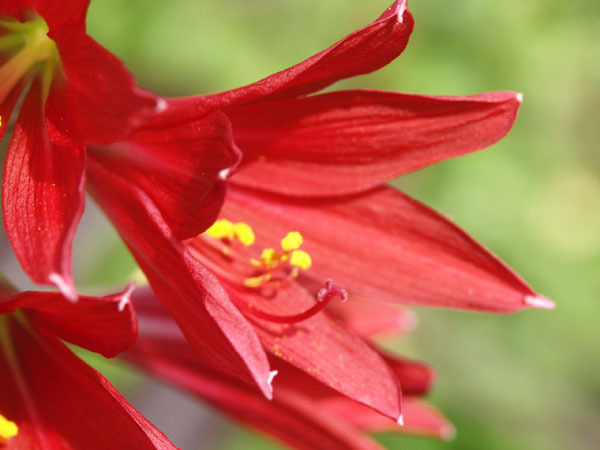 Propagation from seed is necessary as only single bulbs are found in the wild. Alkaline to neutral soils in the wild, always in full sun. The spring/summer growers from the Andes of both Chile and Argentina. They spend a long very dry winter under snow. They include R. rhodolirion, R. araucana, R. andicola, R. elwesii and some 3 or 4 undescribed species. These need cool conditions the year round but are half hardy in places like England. Flowers produced in Spring with leaves in most cases. Propagation from seed but in some species offsetting individuals can be found. Neutral to acid soils in the wild, always in full sun. 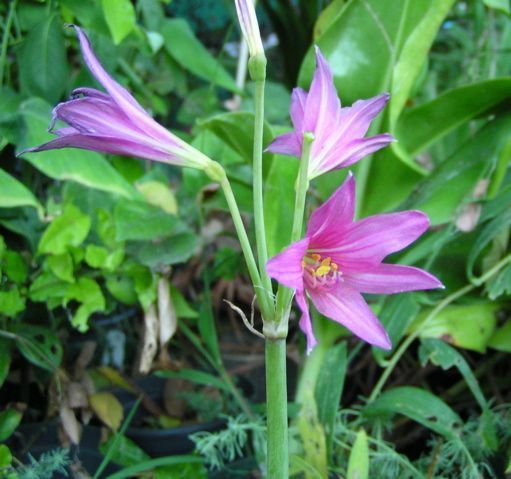 The autumn/winter/spring-growing Rhodophiala bifida from Uruguay and Argentina. It is dormant in summer but receives year-round rains. Therefore intolerant of thorough summer drought that would make it lose the roots. It is quite hardy (-12 °C frosts are experienced by the southernmost populations). Summers always long and hot in the wild. 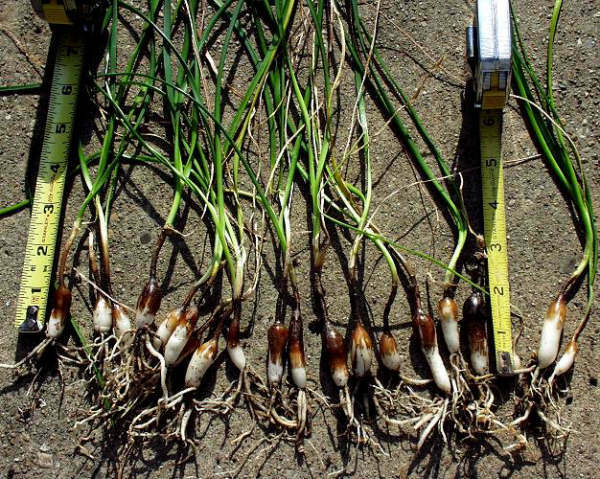 Propagation from seed is necessary as only individual bulbs are found in the wild. There is an interesting range of color forms in this easy species. As a rule a population has flowers of a single color with few if any variant. It flowers in late summer before heavy foliage production. Alkaline soils in the wild although at the northernmost corner of its distribution it grows in acid red clays. Full sun in all cases. 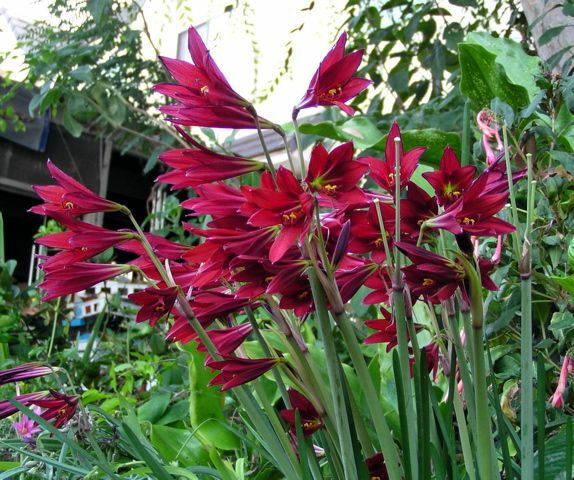 The dark "oxblood lily" form of Rhodophiala bifida grown in Texas. It flowers in autumn before leaves. It is well known by its strong offsetting habit and no seed production. The color form of this variant is found in a population of the Province of Entre Rios, Argentina. 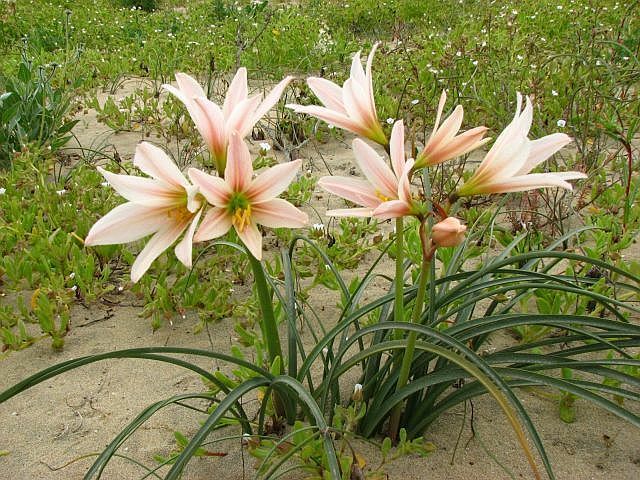 Much of the information on this genus and how to cultivate it furnished by Alberto Castillo in his March 2003 Introduction to the Pacific Bulb Society list topic of the week on Rhodophiala. To grow from seed, material must be sown as fresh as possible. Seeds can be floated in water with good germination (Cathy Craig). Good seeds will germinate in 2-3 days. However, they can be sown directly under 3-5 mm (1/8-1/4 inch) of potting mix with good results (Nhu Nguyen). Sowing of seeds must coincide with the growing season. 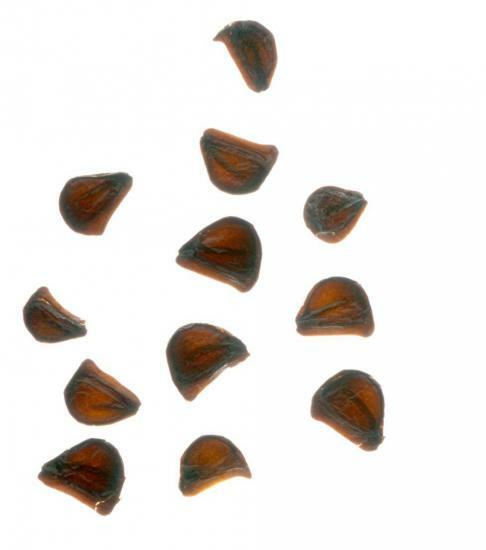 For some high altitude species, seeds may need to be stratified before germination will occur. This can be done by soaking the seeds in water overnight, wrapping the seeds in a moist paper towel, and placing inside a plastic bag in the refrigerator. Check periodically for germination. When the radicle appears, pot up the germinated seeds. 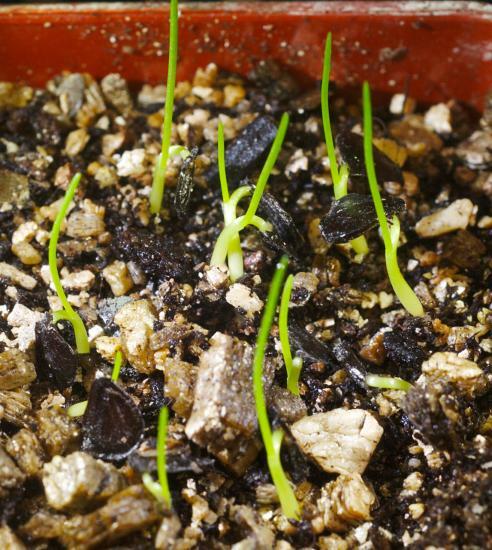 Seedlings will grow well with a little dilute fertilizer and may remain in growth for the first 2 years. 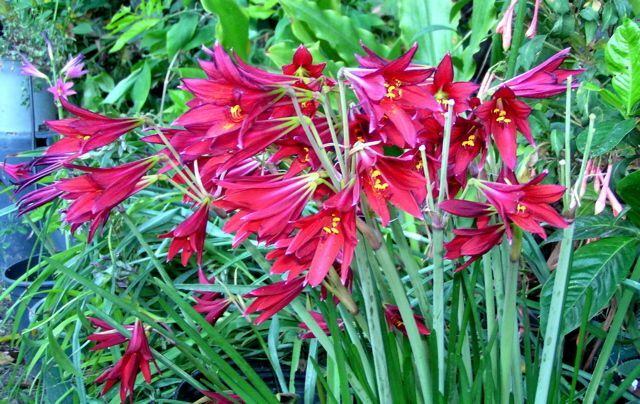 These plants are known for their preference of deep pots and will usually put their bulbs at the bottom of even very deep pots. 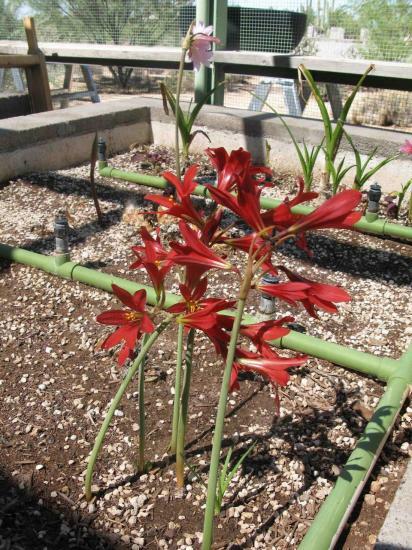 Adult bulbs should be grown in a low organic mix (~1:3 organic:inorganic). 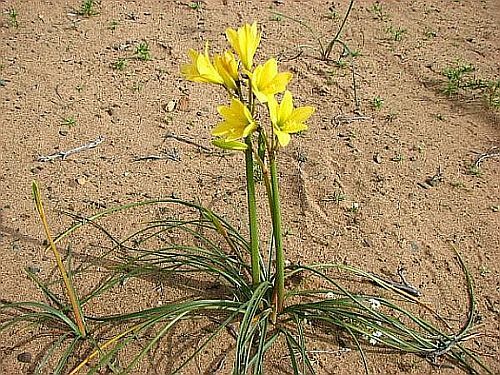 Some species (like the desert species) may rot if kept in excessive rain. Grow these in a very well draining mix (1:9 organic:inorganic) in a terracotta pot. If organic material is low, fertilization with a high P low N mineral fertilizer may be necessary. 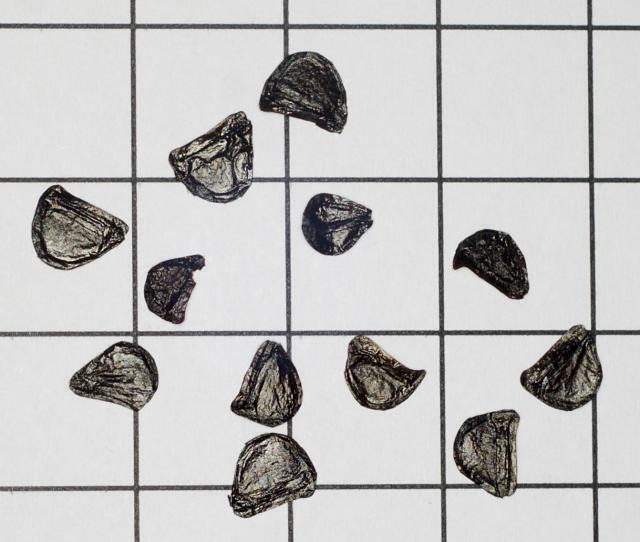 Photographs of seed (10 mm grid) by David Pilling, the second (of the same seeds) using strong transmitted light reveals the embryos, the final photo shows the resulting seedlings a couple of weeks later. 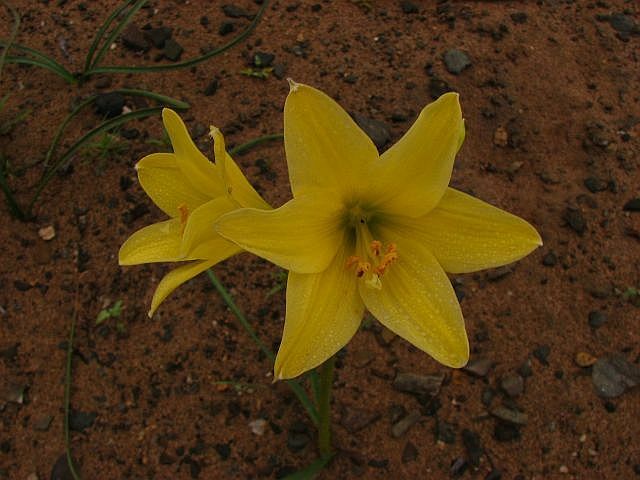 Rhodophiala advena (Ker Gawl.) Traub is an autumn winter spring growing species from Chile that blooms in late spring or summer. Flowers are warm crystalline colors ranging from pale orange to deep rose. Photo one is by Den Wilson of a red form. Photos two and three of two other color forms are by Osmani Baullosa. 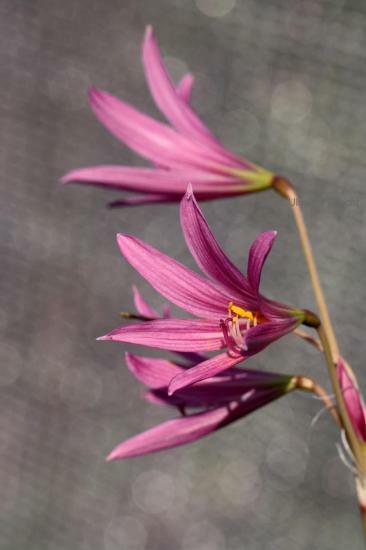 The final photo was taken by Mary Sue Ittner at Telos Rare Bulbs. 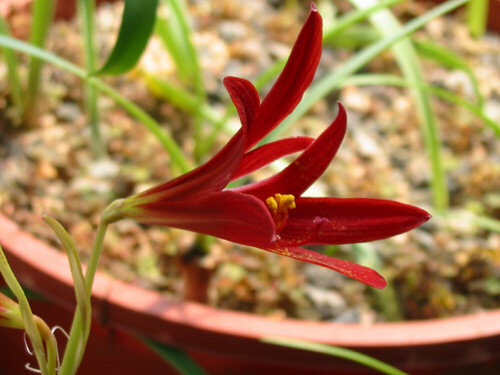 Rhodophiala ananuca (Phil.) 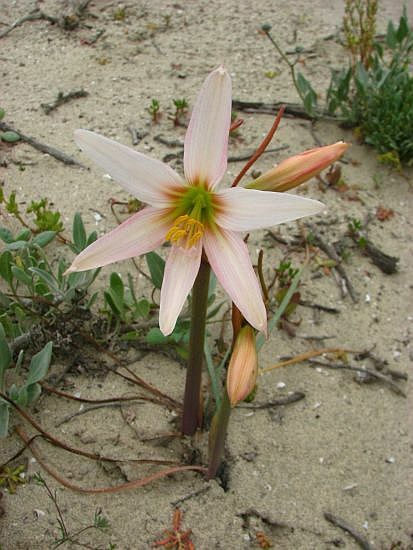 Traub is a species from northern Chile where it grows in coastal areas that are extremely dry, sometimes receiving no rain at all although there are coastal fogs. The photos below were taken spring 2011 in a year with good rainfall by Eugene Zielinski. He remarked that it grew abundantly in white sands between Huasco and Carrizalillo. 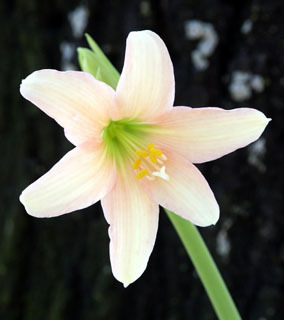 Flowers ranged from white to a pronounced pink, usually with darker veins. 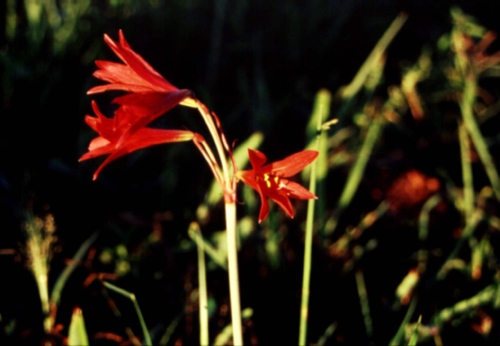 Rhodophiala andicola (Poepp.) 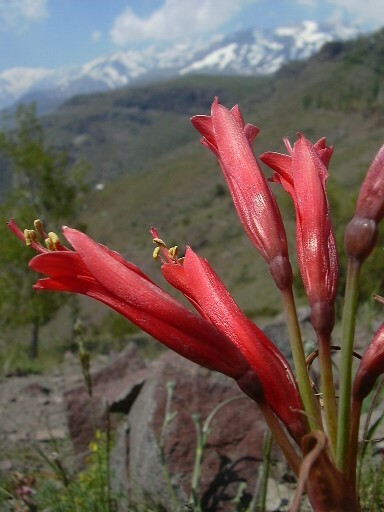 Traub is found in pumice sand, cinder slopes and tussock meadows from 1800-2100 m in the Andes of Chile and Argentina. 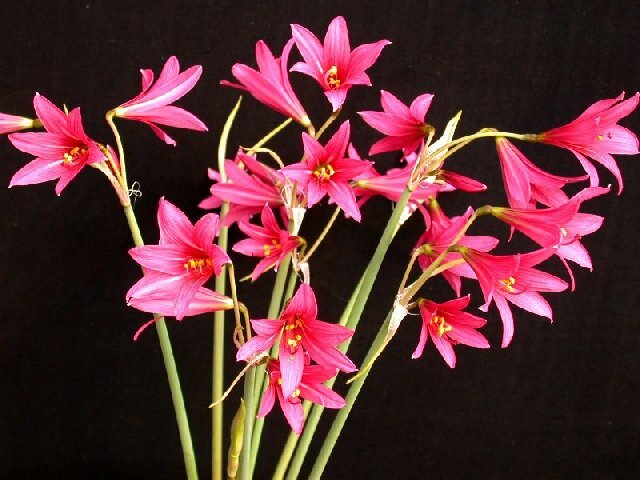 Growing from 12 to 22 cm, it has bell shaped pinkish red flowers. Photo taken by Chris Mallek at Conguillio National Park, Chile. 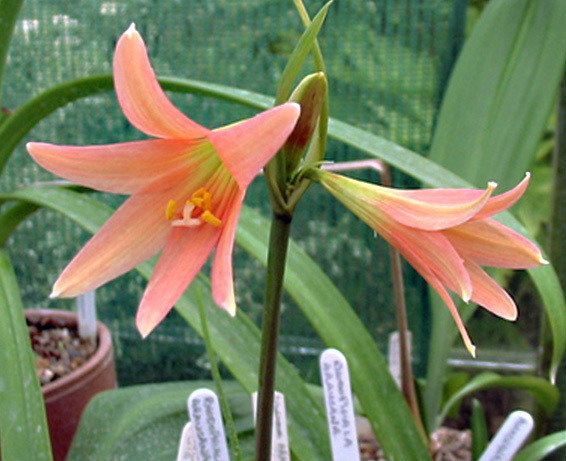 Rhodophiala araucana (Phil.) Traub is a summer-grower. It is reported to be polyploid (2n=54). Seedlings have produced various shades from very pale pink (near white) to peach and bright scarlet-red. Photo by Den Wilson. Photo two is grown from seed acquired from IBS, labeled 9-13-01, but not planted until January 2002. 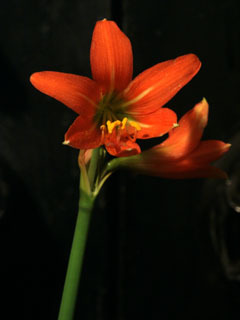 Has been under lights the entire time, the first flower in full bloom, 04-11-2003. Photo by Kelly Irvin. Photo three is the second of only two seed survivors in the before mentioned acquisition, photo taken 05-16-2003. This inflorescence has 3 blooms instead of 2. Amazing how different a sibling can be. Photo by Kelly Irvin. And picture four is another plant showing how incredibly variable this species can be. Photo taken on 11 July 2005 by Mark Wilcox. Rhodophiala bagnoldii (Herb.) 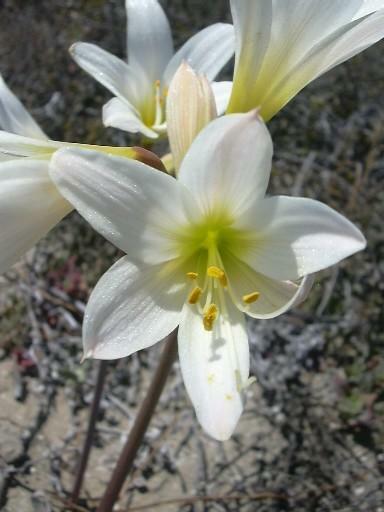 Traub is from Argentina and Chile where it grows in coastal deserts. It is a winter grower with yellow or orange flowers that appear in the spring with leaves often remaining green until late spring. It grows best in a very gritty mix. Photos 1-2 were taken by Osmani Baullosa. 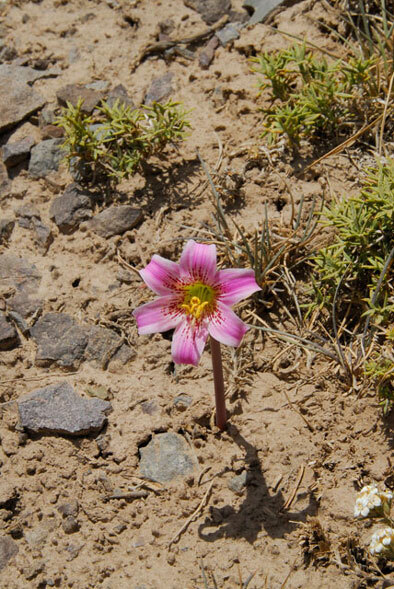 Photos 3-4 were taken by Eugene Zielinski spring 2011 on a trip to Chile to see the flowering desert in a wet year. This species was abundant in the reddish sands between Huasco and Carrizal Bajo, as well as in a few other areas. There was not much variation in flower color. These were photographed between Huasco and Carrizal Bajo. Rhodophiala bifida (Herb.) Cabrera is a very common species in the north east and central Argentina and Uruguay. The flowers can be red, dark red, pink or white. 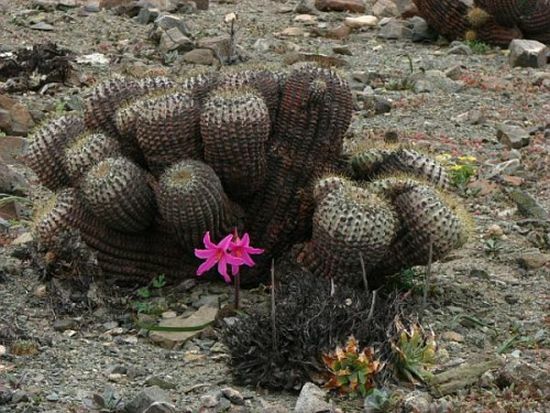 In Argentina R. bifida can be found from Misiones (northeast) to Buenos Aires (central east). The color variation sequence is: red in the north, dark red, pink in the north of Buenos Aires (where white-flowered individuals can be found) and dark red in the south of Buenos Aires. 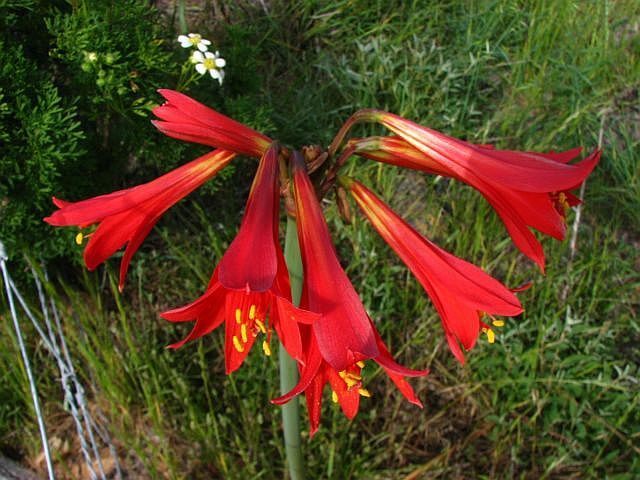 According to Orfeo Crosa in Uruguay the flowers are usually pink near Montevideo and red in the north. Certain forms of this species are self-fertile whereas others are self-sterile. Pictures one through five are all taken by Germán Roitman and represent some of the different color forms. 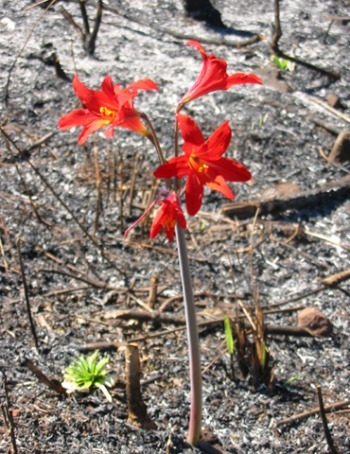 Photo five was taken in April 2003 near Corrientes, Argentina after a fire. The first photo was taken by Bill Dijk. The second photo was taken Sept. 2004 by Lee Poulsen. 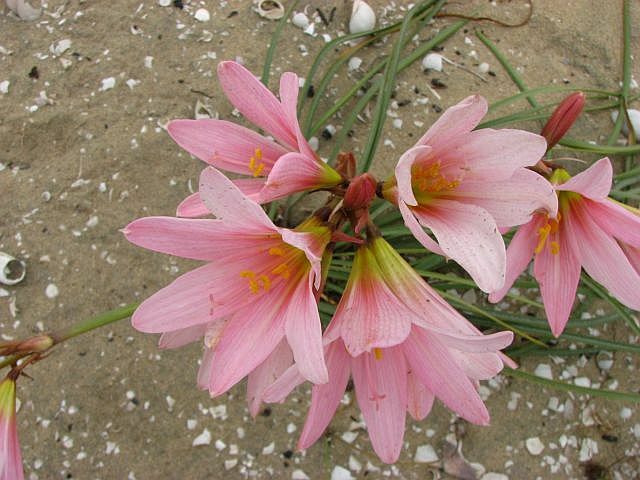 The plant photographed was received as Rhodophiala pratense. 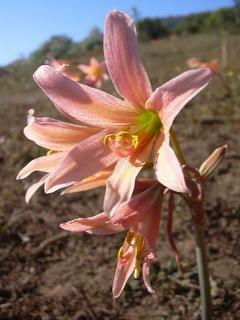 It flowered at the same time as Rhodophiala bifida, and looked like a pink version of it. It looks very much like the rosa form that Germán uploaded. Seed was offered in BX 275. Alberto Castillo explained about the donation. 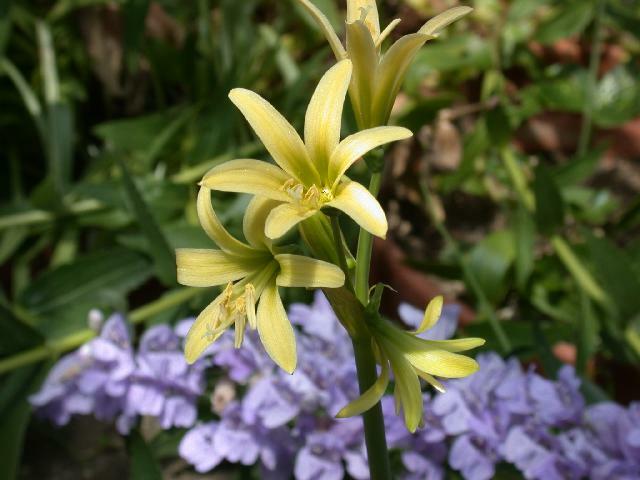 Photograph by David Pilling shows a bulb on 13th August 2012 from seed sown on 6th June 2011. 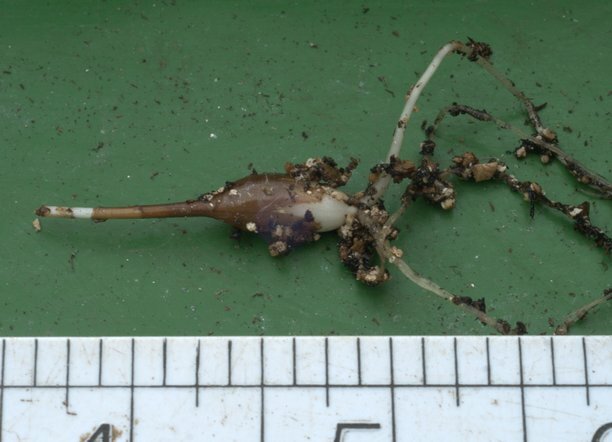 The seed germinated almost immediately at ambient (65 °F) temperature and the seedlings which were kept away from higher temperatures only became dormant at the start of August 2012. 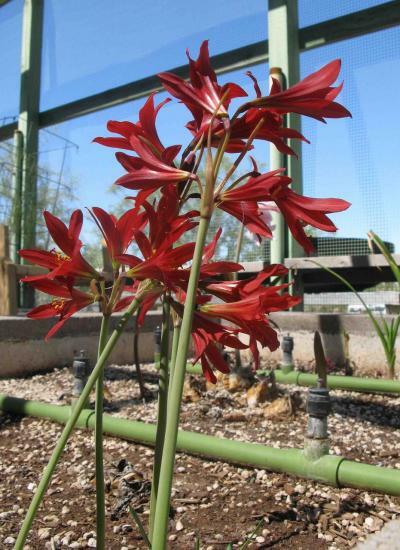 Photo 2 is an unconnected picture of commercial bulbs; the vendor instructions stated that they flower in September before the leaves appear; that they like temperatures not too high during dormancy and deep planting is essential in hot climates. Alberto Castillo wrote about about planting depth and container size in the last paragraph of this comment. 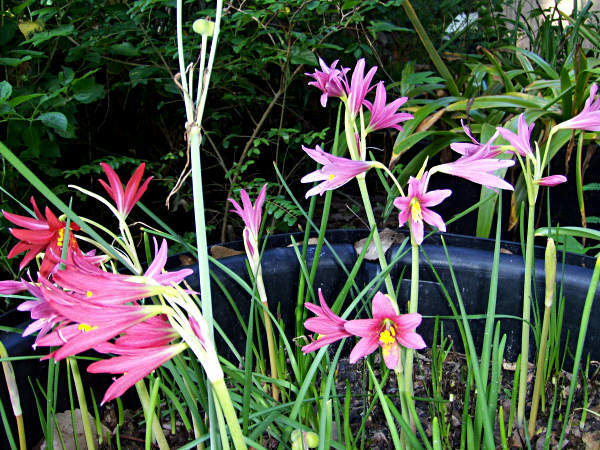 See also Repotting Rhodophiala in the Garden Diary of Judy Glattstein. 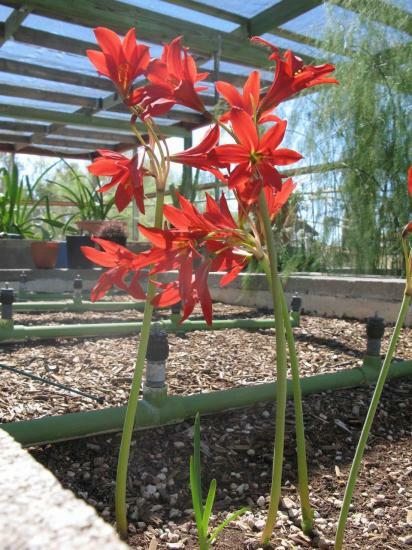 Rhodophiala bifida 'Hill Country Red' (previously known as "Texas red form") is a vigorous form commonly available in cultivation. It is thought that this form is self-sterile because of its (poly)ploidy. However, it may simply be that the form requires another clone for seed production. 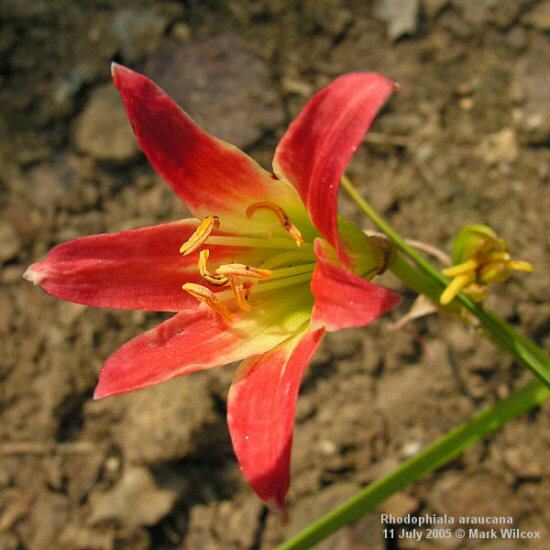 Reports from Bill the Bulb Baron, Tony Avent, and Alberto Castillo confirm that this red form can make seeds (although not vigorously) when crossed with other forms. This form is a vigorous grower and does best in the ground. When grown in pots, it requires a lot of room, otherwise it will split its pot in a few years. Photo 1 was taken by Lee Poulsen. Photo 2 was taken by Mark Wilcox in September 2005 of plants obtained from Plant Delights Nursery. Photos 3-4 were taken Jacob Uluwehi Knecht. 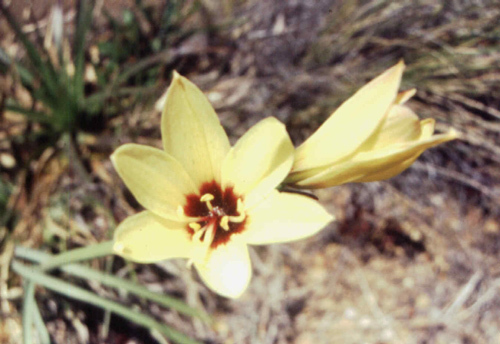 Photos 1-2 were taken in 2003 by Lee Poulsen from bulbs obtained from Old House Gardens. The lighting adds more blue to the photos, making the flowers more purple than red. Photo 2 was taken by Patty Allen showing some of the pink forms she grows. 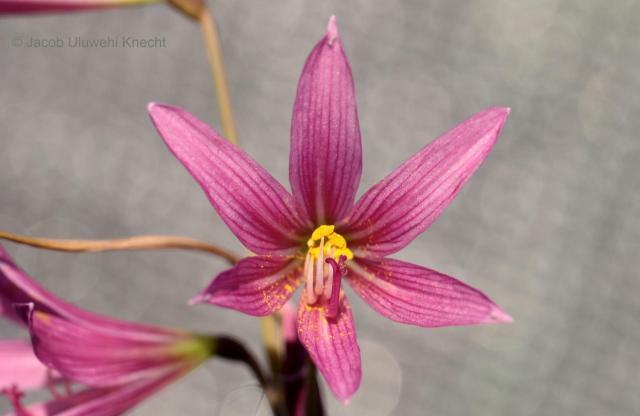 The two photos below by Jacob Uluwehi Knecht show a pink form raised from from BX 174 seeds. 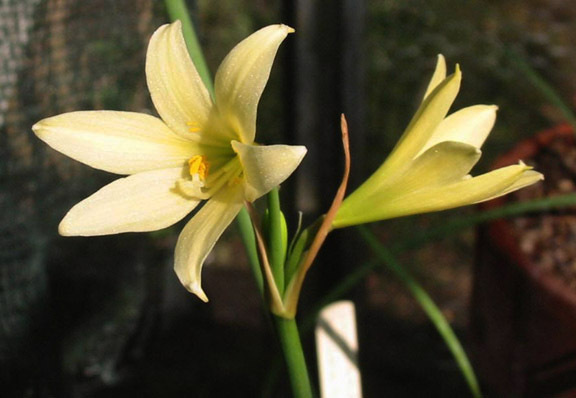 This bulb reached blooming while growing in a narrow pot (7.3 cm wide x 22.9 cm tall). It was planted into this pot as a seedling near the surface but by the time it finally reached blooming, it had moved itself down to the very bottom of the pot with its basal plate near the base of the pot. This form is self-fertile. 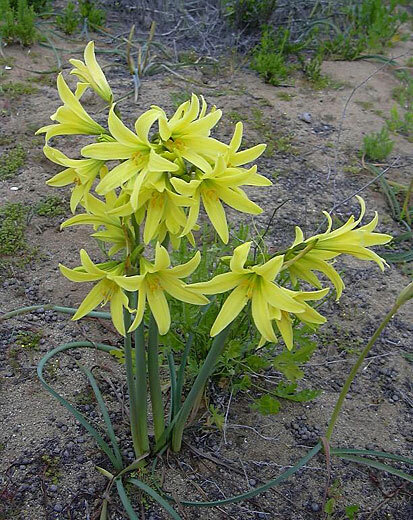 Rhodophiala bifida 'Granatiflora' was considered to be a giant Rhodophiala bifida until Dr. O’Farrell found the true bifida in the same area of Uruguay. 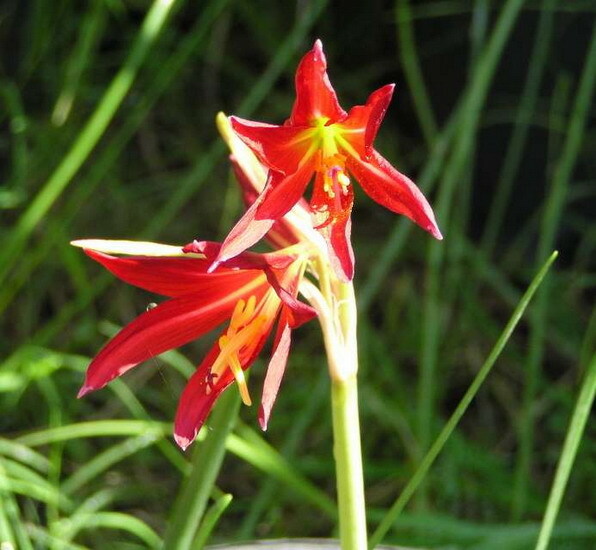 It was apparently named in 1970 Rhodophiala bifida ssp. granatiflora (E.Holmb.) 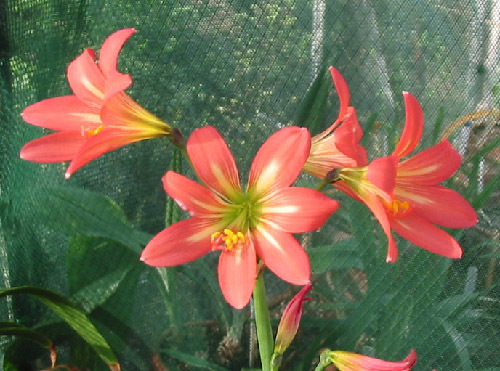 Ravenna but that name is considered by Plants of the World Online to be a synonym of Rhodophiala bifida. 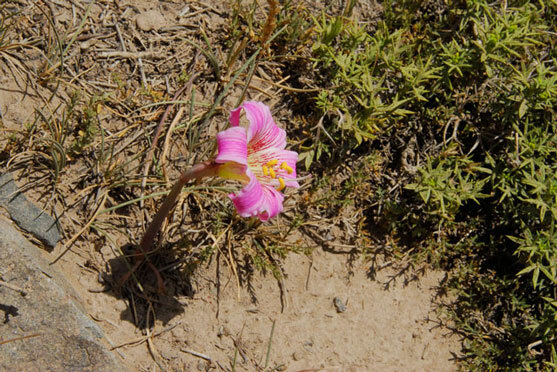 'Granatiflora' is very rare in the wild, only a few individuals remaining. It has the same cycle as R. bifida but conditions are warmer and it is better grown frost free. 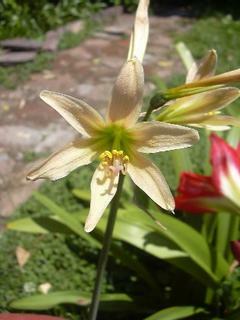 It has very large flowers with blunt tipped tepals (tapering in typical bifida) and is larger in scape, bulb and foliage. 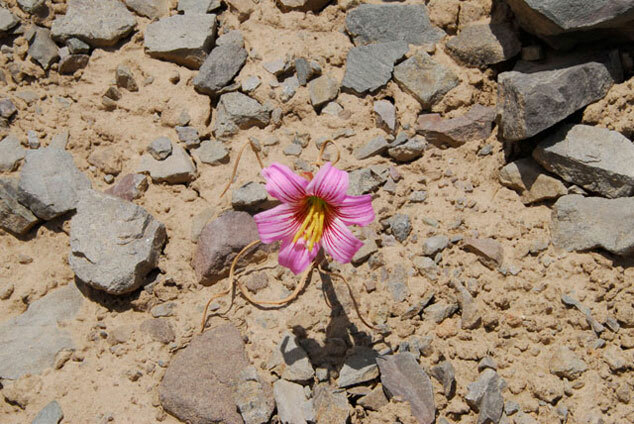 It is found in rocky hillsides in the wild in slightly acid soils. Full sun. The first photo is a picture by Mark Wilcox of 1 year old plants, grown from seed furnished by Alberto Castillo. They were grown under lights inside. 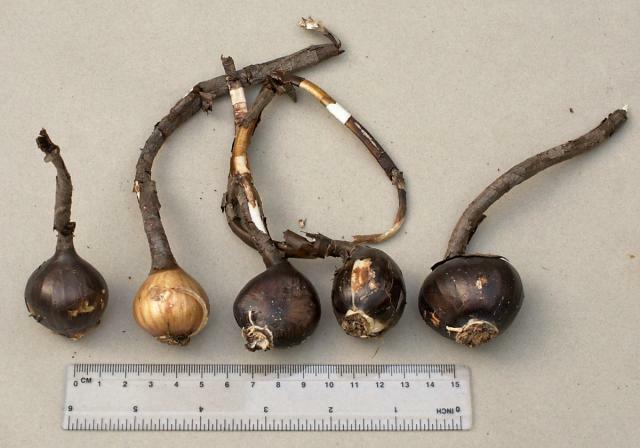 The plants have formed bulbs from 0.5 inches/1.25 cm to 2 inches/5 cm. They're quite different in shape from Rhodophiala bifida, but may be distorted due to the bulbs trying to dig their way through the bottom of the pot. Some roots show a definite corkscrew shape, although not easily visible in this picture. Only the top halves of the bulbs show a tunic. Some have gone dormant while others are in active growth. Twenty plants grew from the seed, which would seem to indicate a germination rate of 100%. 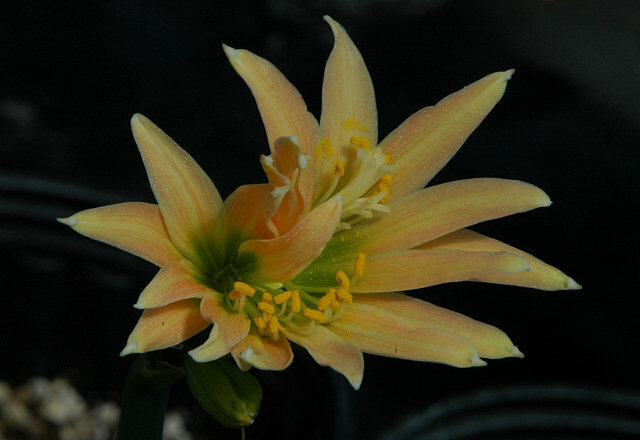 The next three photos are from Pamela Slate of plants grown from Alberto Castillo (BX 171). Flowers did not show the wide, blunt tepals. 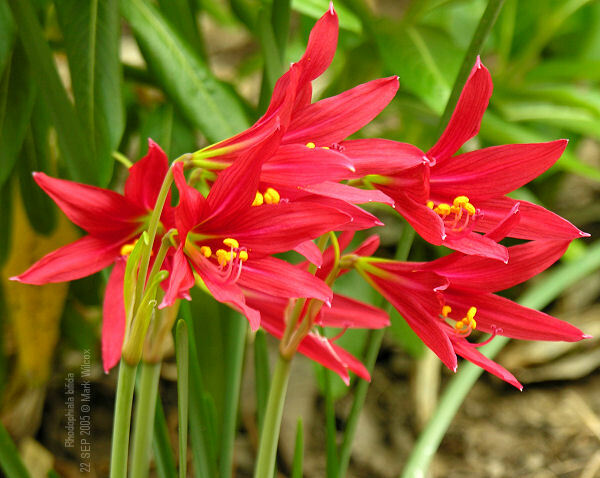 The last photo is a picture by Germán Roitman of adult plants of Rhodophiala 'Granatiflora' from Alberto Castillo's garden. 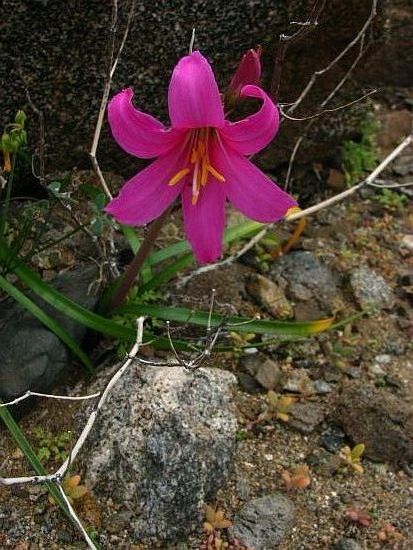 Rhodophiala chilensis (L'Hér.) Traub is a summer-grower. In some forms the outer half of the segments are stained with pink or red. Photos by Den Wilson and Mary Sue Ittner. 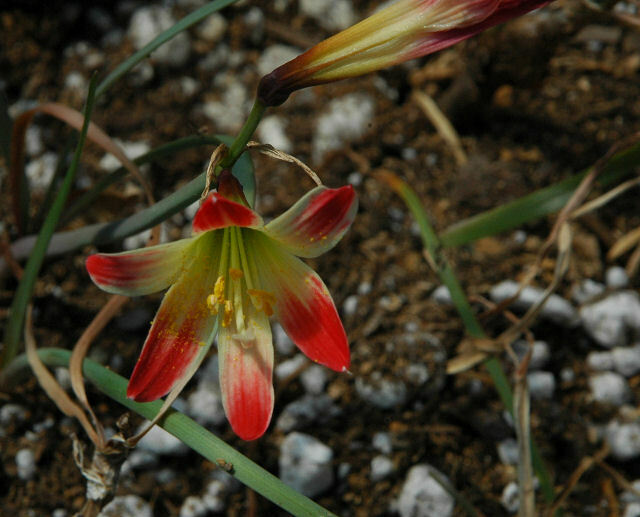 The last two photos were taken at Telos Rare Bulbs. 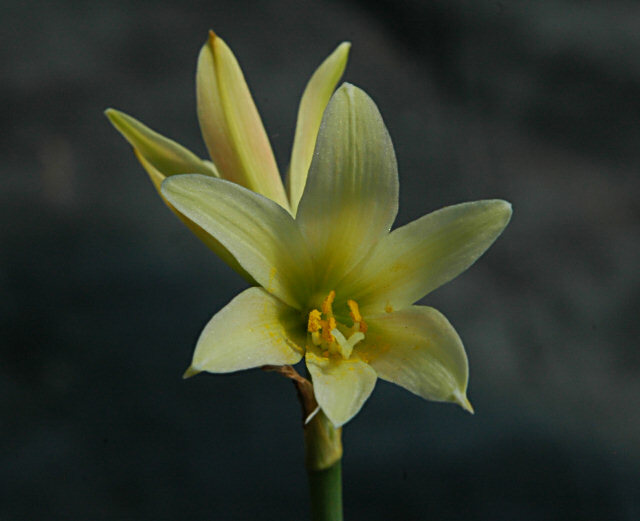 Rhodophiala elwesii (C.H.Wright) Traub from the Argentinean and Chilean Andes has yellow flowers. Photo by Den Wilson. 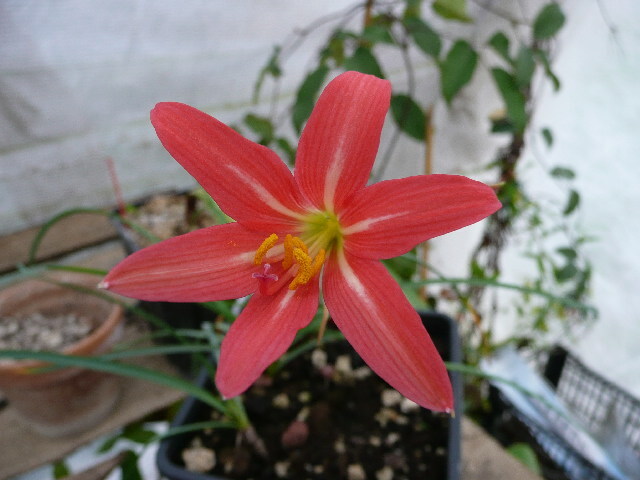 Rhodophiala herbertiana (Lindl.) Hunz. 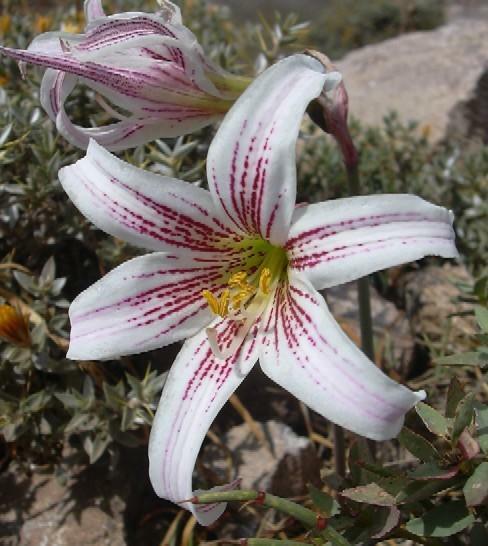 Originally added as an unidentified alpine species, this has been identified by Alan Meerow. The taxonomy is currently a bit in flux and awaiting final work. Renamed by Ravenna as Famatina herbertiana (Lindl.) Ravenna, many taxonomists include Famatina in Phycella and some databases list the accepted name for this species as Phycella herbertiana Lindl. Current work in progress shows Famatina is more closely related to Rhodophiala with both having trifid stigmas and 2n = 16 chromosomes. 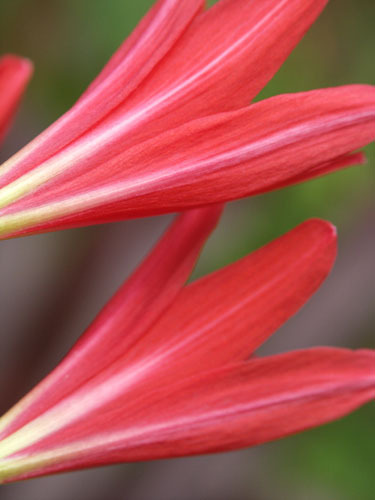 Since Rhodophiala herbertiana is also an accepted name, this is where we are choosing to include it on the wiki. Photo by Osmani Baullosa. 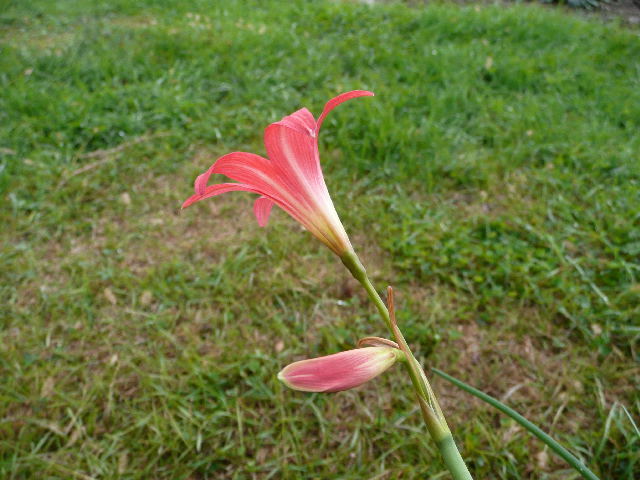 Rhodophiala laeta Phil. 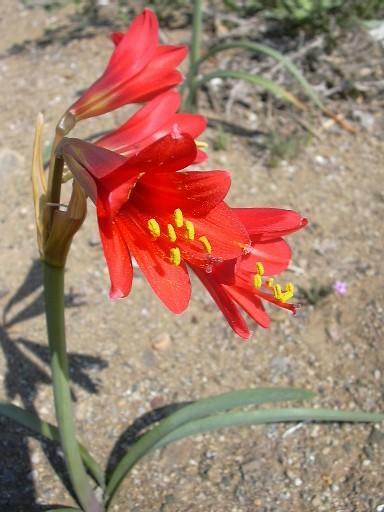 from the coastal mountains of central Chile has red to purple widely opened flowers in late spring. Photos 1-2 by Osmani Baullosa. 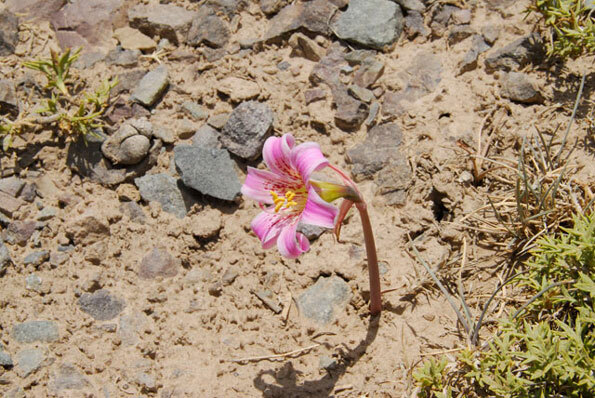 Photos 3-5 were taken by Eugene Zielinski 2011 on a trip to see the flowering desert in a wet year. Photos 3-4 show this species growing among rocks near Paposo. There was not much variation in flower color, but as these pictures show, there was some variation in flower form. The last picture below shows Rhodophiala laeta with the cactus Copiapoa cinerea and the bromeliad Deuterocohnia chrysantha. 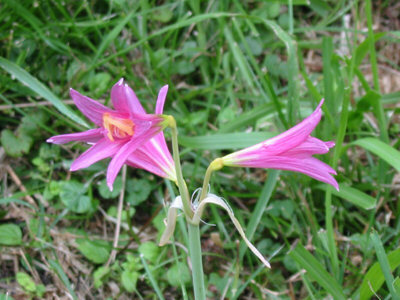 Rhodophiala mendocina (Phil.) Ravenna from Mendoza and Neuquen in Argentina photo by Germán Roitman. This species is considered an unresolved name by The Plant List. 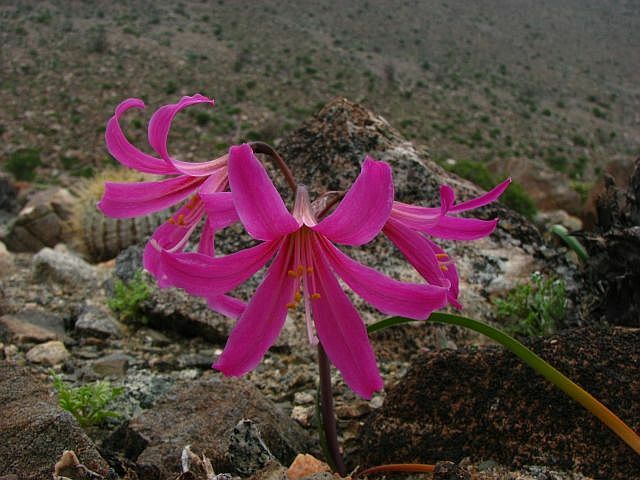 Rhodophiala montana (Phil.) 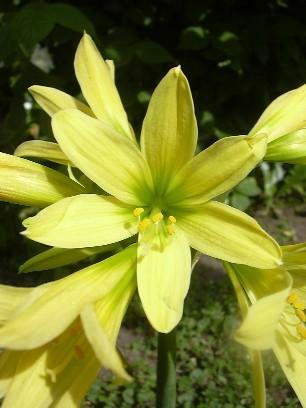 Traub is a yellow-flowered species from the central Chilean Andes. The photo that can be seen at the URL below is tentatively identified as this species. Jane McGary grew it from seeds collected in that region in 1996. 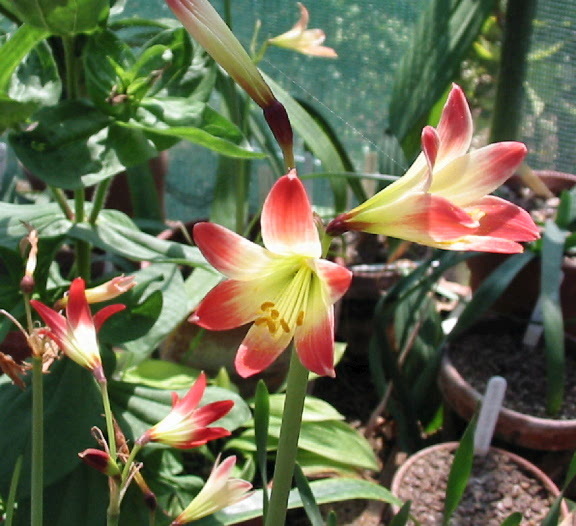 It is shown flowering in an unheated bulb frame (the flowers in the background are a penstemon). One identifying characteristic of this species is horizontally held flowers; this plant is just opening its flowers, but they do orient horizontally later. Rhodophiala phycelloides (Herb.) Hunz. 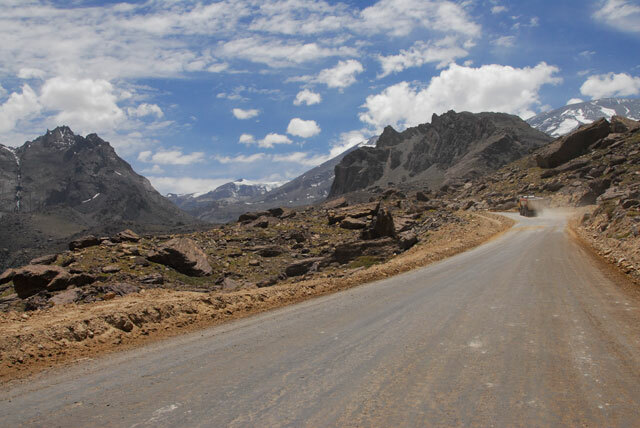 is from the central Andes of Chile where it spends the winter under snow. 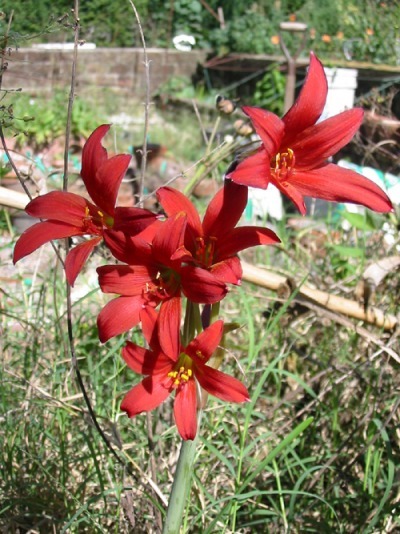 It has 3 to 6 red almost tubular flowers with flared tips and exserted stigmas. Leaves appear with the flowers in spring. Photo 1 by Osmani Baullosa. 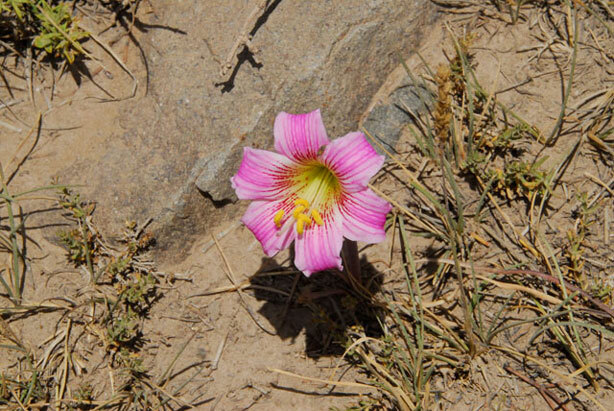 Photo 2 was taken by Eugene Zielinski spring 2011 where it was blooming along Route 5 between Los Vilos and La Serena. Rhodophiala pratensis (Poepp.) Traub from Chile has scarlet flowers that are yellow at the base. 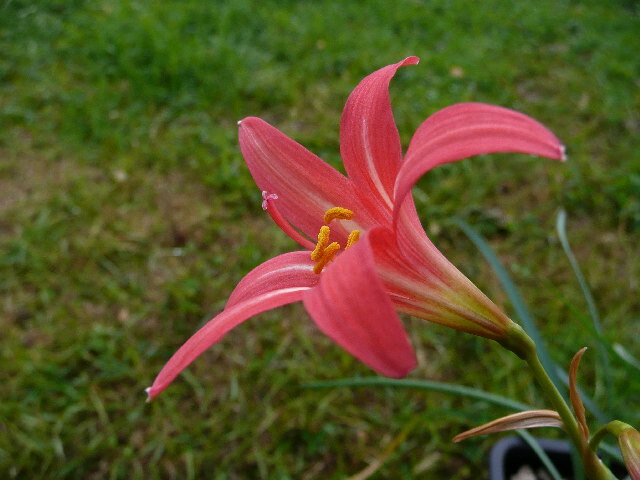 It blooms in early summer with leaves present. Photos by Den Wilson and Mary Sue Ittner. The last photo was taken at Telos Rare Bulbs. 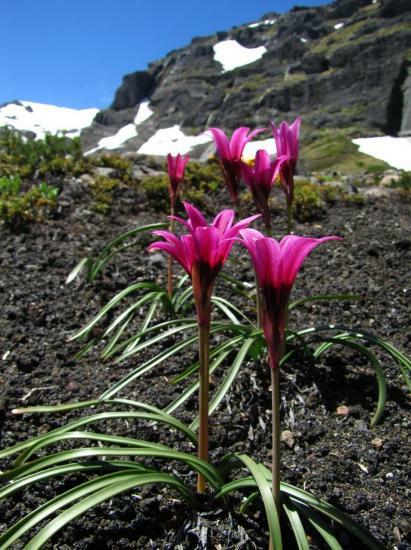 Rhodophiala rhodolirion (Baker) Traub is a beautiful alpine species from the Chilean and Argentinean Andes where it grows in rocky places and spends the winter under snow. 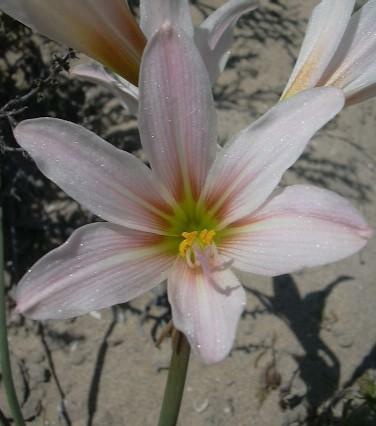 It has white or pink flowers with a greenish yellow base and crimson guide lines often broken into streaks and dashes. Leaves appear after flowering. Photo by Osmani Baullosa. Rhodophiala splendens (Renjifo) Traub is from central Chile. Photos by Alessandro Marinello. To see other pictures of this genus besides those on this page, and for other information (in French), see Pascal Vigneron's web site.